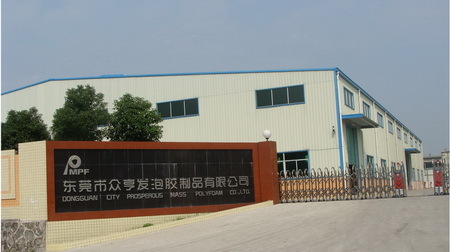 PMPF was established its name in the year 2010 and the factory is located in Chashan Town, Dongguan City, Guangdong Province, which covering a floor area of 15,000 ㎡. The PMPF products are widely used in an expanse of industries - from packaging solutions to automotive components, hobby models to foods, sports to engineering. The company is engaged in mould design,product research & development,special packaging material application and development. Cooperated with rigid cellular plastics supplier like JSP, KANEKA, BASF, Sekisui and also based on our shape moulding techonolgy in polyfoam industry like Expanded Polypropylene(EPP), Expanded Polystyrene(EPS), Polyolefin(Co-polymers,EPO), Expanded Polyethylene(EPE), we are committing to the leadership of market trends,innovation and development and taking an active role in new eco-friendly high-end material's application of EPP,EPS,EPO and EPE. PMPF also proud itself as a pioneer on the EPP/EPO foam moulding technology applications in RC Toy & RC Model Airplane industry. The surface-no-venting technology of model planes applied by PMPF is highly spoken of amongst the whole RC Hobby industry in China. What PMPF prospective: PMPF will keep a foothold on environment protection, keep pace on the art-of-the-state EPP/EPO/EPE applications, carry on and promote the packaging conception of environment protection, energy conservation, innovation and integration. PMPF will also make an establishment of self gratitude and social responsibility corporate culture,serve our loyal clients with brand new attitude and technology,hand in hand with supplier and customer to create a bright future.